The tea tree oil used in this collection are sourced from Australia. Tea trees are shrubs that occur naturally in Eastern Australia and grow along steams and in marshy lowlands. This tea tree oil meets high standards and is harvested and pressed in its purest oil form by local growers. The formula with tea tree oil in this collection gives hair and skin an effective, gently nourish detox, and soothe dry scalp and skin. Vetiver grows all around the world, but the vetiver in Haiti, where Love Beauty and Planet get this admirable essential oil from, is considered by perfumers to be pure and balanced because of its distinct woody dry fragrance with earthy, smoky, and nut inflections. Vetiver comes from the root of the plant and is harvested from January to July. Its delicate sultry fragrance is achieved through a sophisticated steam distillation process. 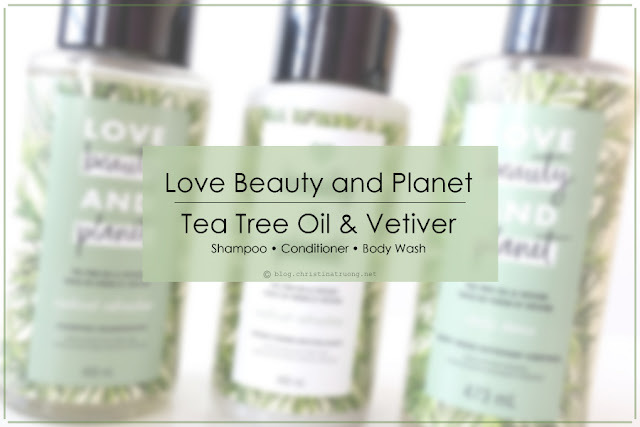 Love Beauty and Planet Tea Tree Oil & Vetiver offers a deep, satisfying sigh of relief and care for the hair and skin. 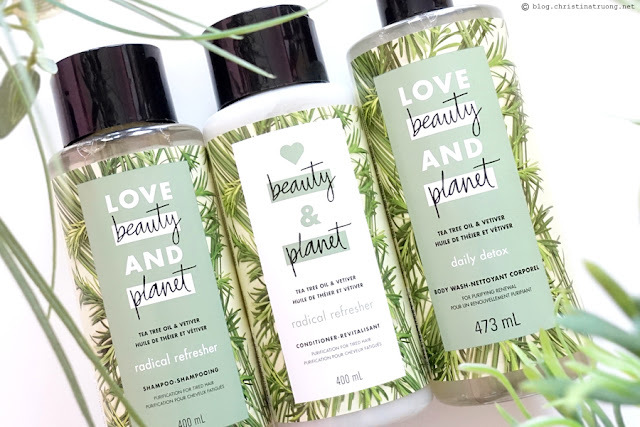 Love Beauty and Planet Radical Refresher Shampoo is formulated with Australian tea tree oil and woody vetiver. It naturally revitalizes and refreshes lacklustre hair, while also clearing away all the bad stuff that brings hair down. The shampoo has a liquid gel-like consistency but once lathered, it foams up and provides a refresh, cooling feeling on your head. That, alongside the scent of tea tree oil and the earthy vetiver really made me feel awaken. The shampoo rinses off easily and leaves hair feeling clean before conditioner. Hit the refresh button. Love Beauty and Planet Radical Refresher Conditioner gently purifies hair. It also offers rich conditioning to revitalize hair's natural strength and protection leaving tresses refreshed with a blend of citrus and woody fragrances. The scent from the conditioner is similar to the shampoo - earthy, woody, smokey. Again, the scent of the conditioner provides that relaxing and refreshing vibe. The consistency of the conditioner is thick - I had to put some force to get the product out. Nonetheless, it lathered into my hair quite well and rinsed off easily and left my hair feeling clean and fresh by the time my hair dried. Give your skin a wake up call with Love Beauty and Planet calming and purifying Daily Detox Body Wash. Infused with Australian tea tree oil and earthy Haitian vetiver, Love Beauty and Planet Daily Detox Body Wash naturally purifies skin and leaves you feeling fresh. The consistency of the body wash is a liquid gel-like texture, not too runny but also not too thick - similar consistency as the shampoo. The body wash lathers amazingly - a little goes a long way and it foams up quite well with or without a loofah. While the body wash lathers well, it also leaves the skin feeling amazing, fresh and awake. The scent provides a wonderful refreshing, cooling, earthy, tea tree oil scent that really gives a relax and refresh sensation in the shower. Overall, there is so much goodness in a bottle of Love Beauty and Planet, not only does it perform well on the hair and body but also for the environment. The Tea Tree Oil & Vetiver made my hair and skin feel wonderfully fresh and smooth. All while providing a refreshing and relaxing scent and feeling that truly made me (and my shower) feel at ease and awake in the end. What are your thoughts on Love Beauty and Planet?